With perfect amount of spices and sweetness of root vegetables, Mulligatawny is one of my winter-time favorites. 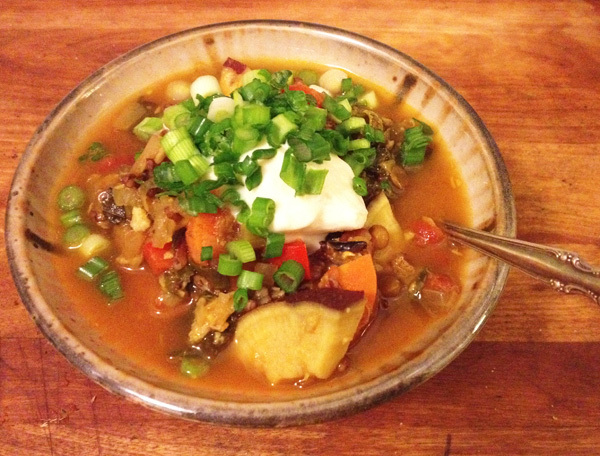 Grains, beans, carrots, potatoes, kales, and lemon, all in one. Chop onion, celery, peppers. Cut carrots, potatoes in bite size. Slice cauliflower if you are using. Crash or mince garlic cloves. Grate ginger. In a large soup pot, heat oil up, Sauteé onion, celery and ginger until tender about 5 minutes. Add all spices, salt and sugar in. Keep sauteéing until fragrance is coming out, but careful not to burn the spices. Add potatoes, carrots, rice, lentils, peppers, tomatoes, dried coconuts and stock. Bring to a boil and reduce heat to simmer for 40 minutes or until rice and lentils are done. Stir in kales, crashed garlic, lemon juice, balsamic vinegar and yogurt. Heat 2 minutes. Ladle the soup in a bowl, garnish with chopped scallions. *This soup gets better next day. This is my first trial of vegan meatballs. I’ve been collecting recipes for them. I tweaked a bit of it. They are yummy by themselves without tomato sauce as well. Splash olive oil in a medium sauce pan. Heat it. Sauté onion, garlic, kale, carrots and mushrooms for a few minutes until they welt. Smash cooked beans with a folk. Put cooked vegetables, beans, and all the remaining ingredients in a big bowl. Mix it well. Roll the mixture into golf ball size. You will make about 20. Coat a baking sheet with olive oil. Place meatballs on the baking sheet. Preheat an over at 360ºF. Bake meatballs for 20 minutes. Gently flip them. Bake another 20 minutes. 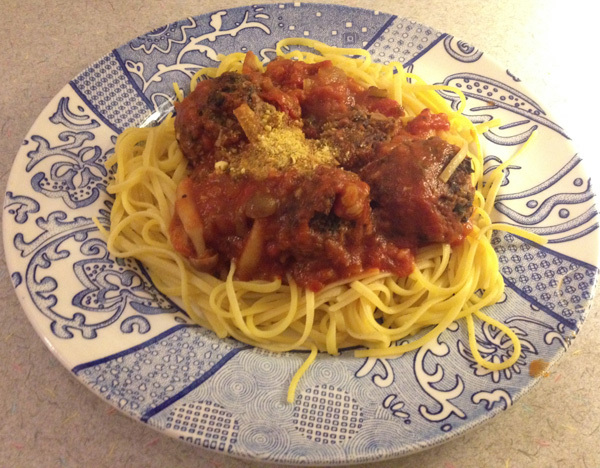 *I used leftover marinara sauce and served the vegan meatballs over cooked quinoa spaghetti. I accidentally took this recipe down. 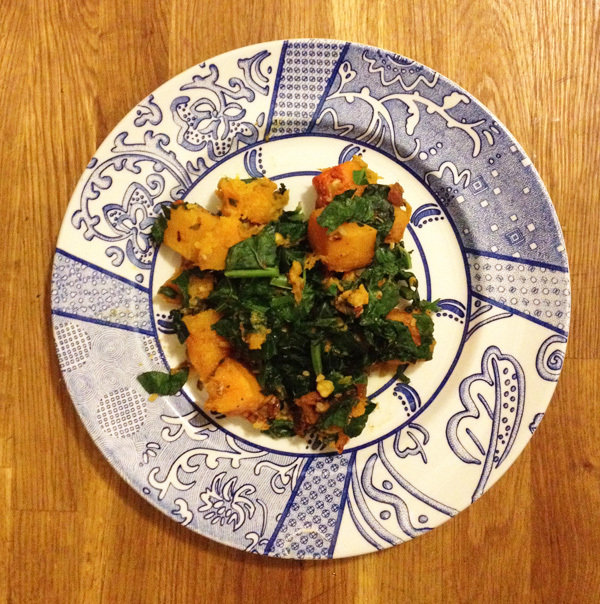 So here it is once again fabulous roasted butternut squash recipe. For a vegan Thanksgiving, this is a must dish. Peel butternut squash. Halve it. Seed it. Chop it in inch cubes. Mince garlic. Mince parsley. Preheat the oven at 375 ºF. Put butternut squash, garlic, and parsley in a deep large enough pan or baking sheet. Sprinkle olive oil over, and toss with your hands. Cover loosely with foil. Roast for 30 minutes until butternut squash is almost done. Test with a folk. In a small bowl, mix roughly chopped nuts, nutritious yeast, and salt and pepper. Chop kale. Uncover the butternut squash. Pour chopped kale and nuts mixture over. Mix well with a spatula. Roast at 350 ºF for another 10 minutes or so until kale is welted. When I went out for a scrumptious lunch with 2 oldest friends at New Leaf in Fort Tryon Park a few weeks ago, a friend ordered Salad Trio for me, but loved it so much she is still talking about it. What she loved so much was Wild Rice Salad in Salad Trio. The other salads were a piece of roasted red pepper and a slice of mozzarella, and mixed greens, and they were not special at all. 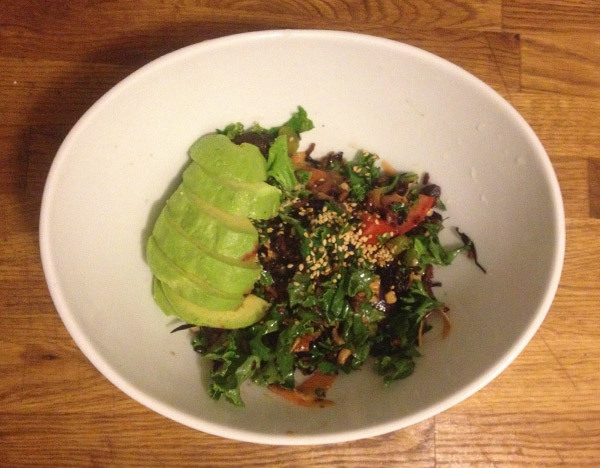 Inspired this and having my own wild rice mix, I decided to make wild rice salad. The result: ambrosia. Cook 1 cup wild rice with 2 cups water. Soak rice over night if you have time. I have a rice cooker, so I turn it on and forget about it. If you are cooking wild rice on a stove top, definitely pre-soak. Set it high until it boils. Reduce the heat to low, cover, and let it simmer for 45-60 minutes until water is gone and rice is done. Let it cool. In a big bowl, put all the salad ingredients, pour the dressing over, and mix well. Peel and slice avocados (1/2 avocado per person). Spread avocado slices over the salad. I wanted to make this wild rice salad, and that was why I cooked wild rice a couple of days ago. Finally I could get to it. You have to cook a few things separately, but yes, it was worthy it. Cook wild rice. Let it cool. Drain tofu on a slanted plate for at least 15 minutes. Chop scallions and kale. Heat a frying pan. Splash olive oil, sautée kale and scallion for a few minute until they become soft. Lightly season with salt and pepper. Set it on a side. Julienne or thread a carrot. Chop a bell pepper. Wrap tofu with a paper towel to take moisture out. Cut it into 1/2″ cubes. Heat a frying pan with coconut oil, cook tofu in it until they become lightly brown. Splash 2 Tbsp soy sauce over them. Make Dressing: In a small bowl, whisk white miso, rice vinegar, orange juice, hot sesame oil, and grated ginger. In a big bowl, mix wild rice and vegetables. Pour the dressing over and mix lightly. 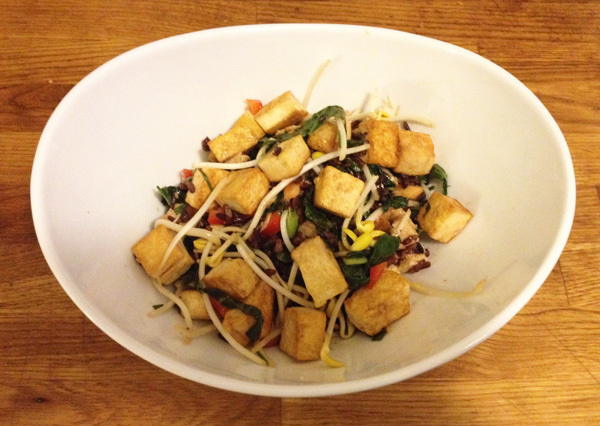 Put the salad mixture in a bowl and sprinkle cooked tofu over. Serve room temperature or chilled.